In the fight against falling incomes, community pharmacies need effective ways to promote themselves, their products and services. Screens showing targeted advertising, tailored to the individual pharmacy, can be installed inside premises – so people see them while waiting for their medicines – or in the window, so they can be seen by passers-by. But is this a viable way of gaining new business? C+D speaks to three community pharmacists who have invested in digital screens for their views. A business review prompted Dears Pharmacy to install digital advertising screens in its branches in Edinburgh and Fife. And it’s paid off in spades, with increased sales and impressive growth in private services income. When Mr Nickkho-Amiry joined the five-branch family chain in 2015, he looked at “the direction of travel of the business, and what we wanted to achieve over the next five years”. The group decided to install a digital screen in the waiting areas of all five of its pharmacies. They opted for a silent screen that showcases the pharmacy’s services on a 20 minute loop. Not only is it a good way of engaging customers, it also “helps to manage the cost of having to print lots of different posters all the time”. He says the screens have made a real difference to the pharmacy income. Within 15 months of installing the service, sales of retail products have seen a 400% increase. Income from private services “has gone from nothing to six figures”. The pharmacy pays a monthly fee for the screens and the service advertisements. They also have an arrangement with suppliers to show adverts for their brands on the screens. This makes it “cost neutral” to the pharmacy, Mr Nickkho-Amiry explains. He says that “customers love it” and are now much more aware of the range of services they offer. Mr Nickkho-Amiry urges pharmacies to “take the leap”. He says digital advertising allows them to reach “that generation of worried well” who “are willing to invest privately in their own healthcare”. 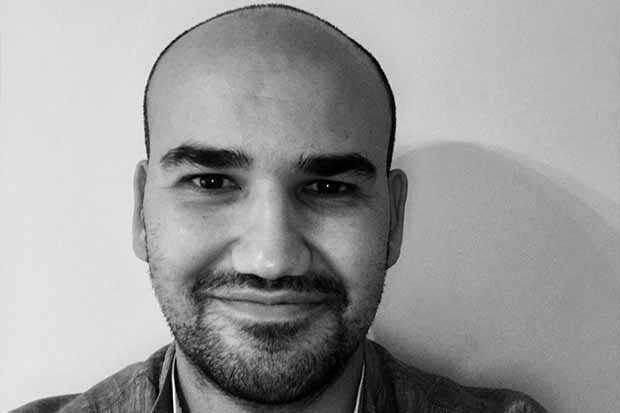 The decision to have digital advertising in his pharmacy “crystallised during one of our brainstorming sessions to explore novel ways to communicate with customers and patients”, he recalls. He wanted a cost-effective way to communicate with patients when staff were busy or the pharmacy was closed. Social media was one option, but Mr Nandha felt it was not the best way to reach the pharmacy’s many older patients. 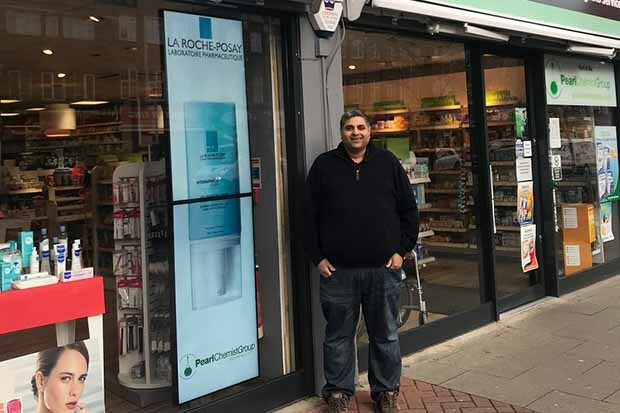 “I was convinced that a digital screen could provide the perfect opportunity to connect with our patients while they waited for their prescriptions in the pharmacy, but equally to catch the attention of passers-by with a screen in the pharmacy window,” Mr Nandha explains. After some research he opted for digital displays with content provided by Healthpoint TV, which provides marketing services to pharmacies. The pharmacy uses screens inside the pharmacy and in the window to advertise the NHS services it provides: medicines use reviews; flu vaccination and emergency hormonal contraception. It also advertises health promotion initiatives. The screens have resulted in “new footfall and business to our pharmacy”, including sign-ups to the electronic prescription service, Mr Nandha says. “We know that [the marketing] appeals to our customers from the level of interest that is generated,” he adds. Pharmacies that are looking to install digital advertising “need to be prepared to put some time into it to regularly update content”, he advises. But Mr Nandha believes the effort is worth it. The screens “offer a unique opportunity to project your pharmacy to your existing customers and reach out to new and potential customers”. Pearl Chemist was an early adopter of digital advertising screens, with a screen in their pharmacy 10 years ago. Unfortunately, their first provider went out of business. “At the time [digital advertising] was too radical,” says Mr Patel. But as the pharmacy expanded to 13 branches across south London, Mr Patel became keen to reintroduce the idea of digital advertising, using screens to reinvigorate his window displays. Other problems include posters going out of date, getting faded by the sun and not being taken down when they are no longer needed. With 13 branches, it was getting more difficult to keep all the window displays fresh. Two years ago, Mr Patel and his brother Vijay, who is a company director, decided to install digital screens in the windows of all their branches. They chose portrait shape screens and did site visits to check the size screen was appropriate. They decided against screens inside the pharmacies because of difficulties with finding the right size screen. He says buying the screens and the media service “could cost a couple of thousand” pounds. The adverts can be set to run whenever you want – for example, during opening hours, or from 7am to catch early morning commuters. They feature messages about the pharmacy’s clinics and services, and NHS awareness campaign messages. Mr Patel says that since the digital screens were installed, “customers have become more aware of our services”, and he has noticed more people asking about flu jabs, for example. Mr Patel advises pharmacists who are considering installing digital advertising to do their research and talk to pharmacists who use them. He agrees the investment is worth it, because “these screens are avenues to let the public [know] what you do”. 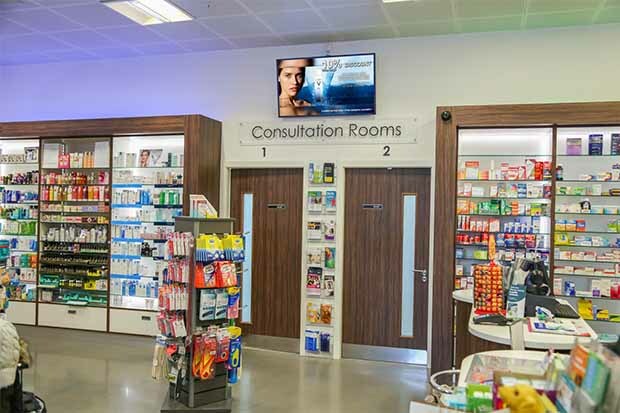 While digital screens may seem like a significant investment up front, they can look smart, attract customers and spread the word about pharmacy services. The pharmacists C+D spoke to consider them a worthwhile addition to their tools for marketing their pharmacies and the results show their investment has paid off in the long run. What is your favourite pharmacy marketing tool? Digital innovation is key not just to advertise pharmacy services to the public, but also to help manage backend pharmacy operations, and regulatoryr requirements. Its good to see the positive impact on these pharmacy through investment in digital technology. Thanks for getting in touch, James. Yes, all the pharmacies mentioned used Healthpoint. Interested in installing this in our pharmacy...just wondering did all the pharmacies mentioned use healthpoint or other providers?